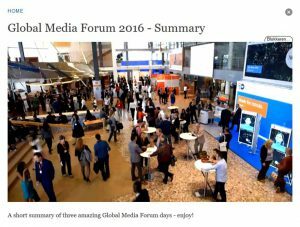 SUMMA was presented at the ninth edition of the Global Media Forum in Bonn, Deutsche Welle’s annual conference for media, with presentations, lively debates and high-profile speakers. Over 2000 guests attended the event, drawing policy makers, academics and journalists from over 100 countries. The main theme this year was “Media. Freedom. Values.” As the DW Director stated, disinformation and manipulation of public opinion is all too common in this digital age. A new approach is needed, open-mindedness and an exchange of knowledge, using social media channels to interact with the audience, and verification and fact-finding are essential in delivering journalistic content to our audiences. 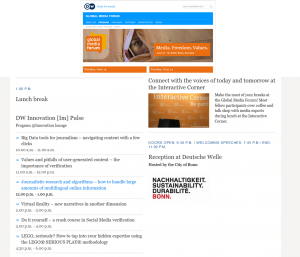 The Deutsche Welle Innovation Projects department had its very own Innovation Lounge at GMF 2016, which attracted a lot of attention and was well visited during the three days of presentations and discussions on innovation in media, with about 35 attendees per session. SUMMA was part of the presentation by Peggy van der Kreeft on “Journalistic Research and Algorithms – How to Handle Large Amounts of Multilingual Online Information”, discussing the use of language technologies and semantic analysis to structure broadcast data using automated processes. It also included two related projects: EUMSSI (Event Understanding Through Multimodal Social Stream Interpretation), and MultiSensor (Mining and Understanding of Multilingual Content for Intelligent Sentiment Enriched Context and Social Oriented Interpretation). The combination of multilingual monitoring and comparison, automated translation, audiomining, and summarization for applications for journalistic production was the main focus.